Having sickle cell disease carries serious risks of complications, which can make the decision for motherhood more difficult. This genetic condition is growing in prevalence around the world, and it is more common among Blacks and Hispanics. 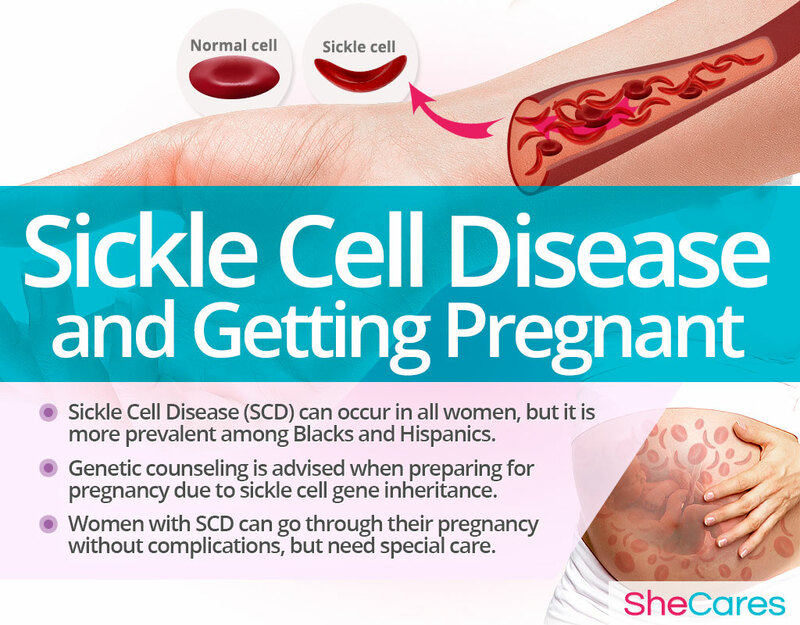 Fortunately, with careful monitoring and proper care, the majority of sickle cell women have successful pregnancies. Keep on reading to learn about the ways in which you can prepare yourself for pregnancy and not let your sickle cell disease stop you from being a mom. Sickle cell disease (SCD) is a group of heritable conditions passed on to a child when both parents contribute a gene. It is characterized by an abnormally shaped hemoglobin, which is a protein found in the red blood cells (RBC) and responsible for carrying oxygen throughout the body. Its unusual C-letter shape prevents RBC from moving smoothly through the veins and arteries, bringing about numerous symptoms and risks. 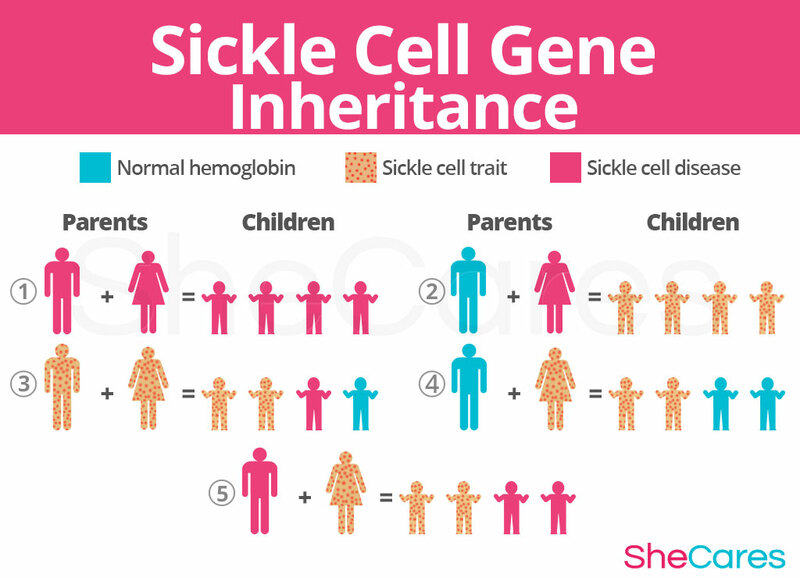 Sickle cell trait (SCT), however, occurs when only one parent passes a gene, resulting in a child being a carrier without developing the disease itself. There are a few recognized types of SCD, such as sickle cell anemia (SS), sickle hemoglobin-D disease, or sickle beta-plus thalassemia (SB), none of which can be cured. When both parents have sickle cell disease, then each child will have the disease as well. When only one parent has sickle cell disease, then each child will have sickle cell trait. 25% chance to have normal hemoglobin. 50% chance to have sickle cell trait. There are prenatal tests to check whether a baby inherited a gene for sickle cell disease or trait. 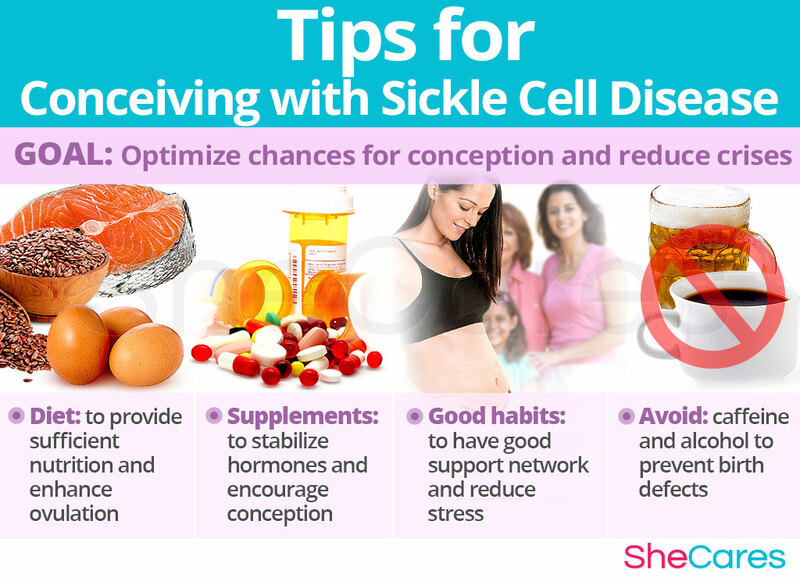 The majority of negative effects are seen among women with sickle cell disease, but those carrying a trait have to take their condition into consideration when preparing for pregnancy due to gene inheritance. Ovarian dysfunction due to diminished blood and oxygen supply to vital organs might disturb the production of key reproductive hormones. This, in turn, can deregulate menstrual cycle and increase the chances of infertility. Transfusion-induced iron overload can lead to an imbalance in FSH and LH levels and hypothalamic-pituitary dysfunction, resulting in infertility. Premature ovarian failure, which brings about early menopause and leads to infertility, might occur after bone marrow transplant in some women. During pregnancy, the episodes of sickle cell disease pain - called crises - tend to increase in their frequency and severity. Mothers are put at an increased risk of stroke, pulmonary hypertension, anemia, infections, and multi-organ dysfunction. SCD might also affect the developing baby due to an insufficient oxygen supply, resulting in severe anemia, poor fetal growth, or low birth-weight. Severely uncontrolled sickle cell disease might result in preeclampsia, preterm labor, miscarriage, or stillbirth. Drink six to eight glasses of water a day, to support circulation and decrease the frequency of crises. Prenatal vitamins, especially folic acid or zinc, are a must during pre-conception and are necessary for women with sickle cell to make new red blood cells. Read more about prenatal vitamins. Hormone-regulating supplements, like Macafem, can resolve your hormonal imbalance, thus restoring menstruation, decreasing painful menses, and increasing your conception chances. Fish oil supplements, particularly those high in EPA and DHA, can relieve painful flares characteristic of sickle cell disease. B6 and B12 vitamin supplements have been shown to provide protection from tissue damage common to sickle cell disease, especially when taken with vitamin C and folic acid. L-arginine and L-carnitine supplements might be beneficial for those SCD women who suffer from pulmonary hypertension and heart problems. Opt for regular, moderate-level exercise to take advantage of pain-relieving properties of endorphins and other effects of exercise on overall health, like a good fertility boost. Swimming, walking, biking, or recreational hiking are great examples! 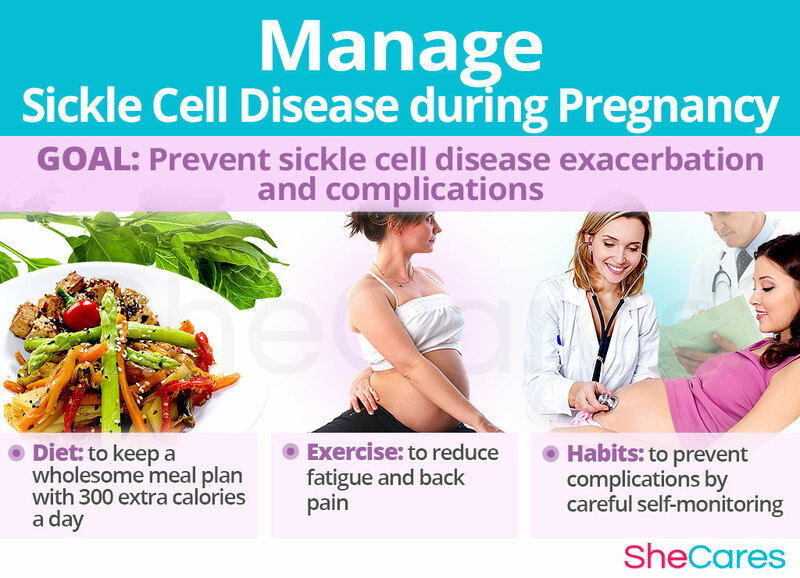 Do not work out strenuously to avoid sickle cell crises and prevent menstrual cycle disturbance. Although pain-relieving medications are often necessary to manage sickle cell crises, use them with caution as their excess might cause kidney complications. Acupuncture can safely and effectively relieve sickle cell pain. Heating pads or a hot bath can also help alleviate painful symptoms. Consider undergoing genetic counseling to fully understand the mechanism of sickle cell gene inheritance and the associated risks. Discuss your current medications and supplements with your hematologist as some SCD drugs, like hydroxyurea, might increase the risk of birth defects. As you attempt to get pregnant, it is a good idea to think of all the ways to help you be prepared in the case of a sudden flare-up of your condition. Focus on omega-3 and protein-rich foods, such as salmon, walnuts, flax, or eggs, to boost your fertility. Create a strong network of family and friends to lean on during conception and pregnancy. Consider therapy if prolonged stress and anxiety are an issue. Mindfulness or art therapy have been shown helpful in preventing sickle cell disease symptoms. Try to maintain stable body temperature as its rapid changes might result in sudden flare-ups. Not all women experience a worsening of their condition during pregnancy, but having had created an action plan prior to conceiving will now give you a peace of mind that you have the means to face the crisis, if it occurs. Maintain frequent doctor's check-ups to address any new symptoms before they lead to complications. Your doctor might put you on low-dose aspirin to lower the risk of developing preeclampsia. It is important to remember that sickle cell anemia in pregnancy cannot be improved merely by taking iron supplements, and it often requires transfusion. 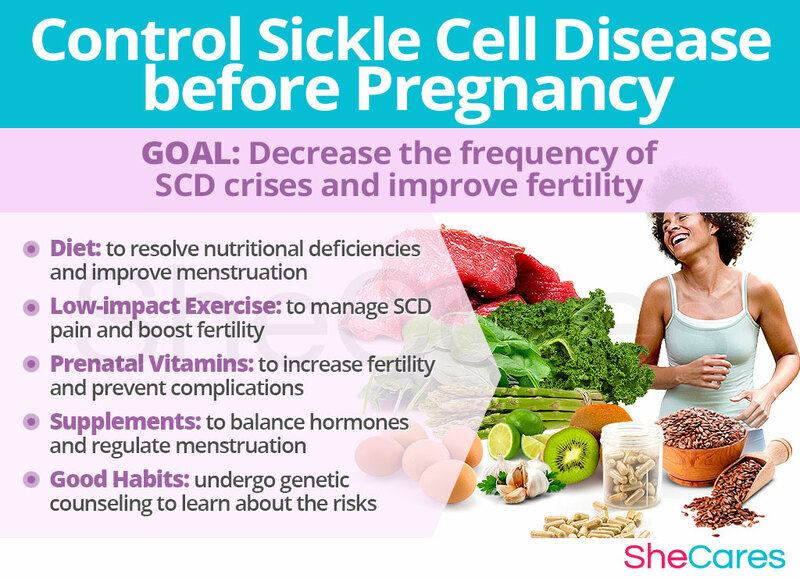 It is clear that sickle cell disease in pregnancy is a challenge both for women and their doctors, but it does not have to be an inhibiting factor. Most women SCD have manageable pregnancies and healthy babies, which can be achieved through diligent monitoring, proper diet, and supplements, like Macafem. Thanks to the advances in medicine, SCD females enjoy an improved life expectancy and can fulfill their maternal needs as well as other women.